I know you’ve experienced sharing a “fact” you’ve known for years only to have someone point out that it’s actually wrong. In the fast-changing tech universe, that’s very common. Here are seven myths that I hear people say repeatedly, but which are not exactly accurate. Many people are afraid to charge their phone or tablet overnight because they think it might overcharge and destroy the battery. I also field this question from people worried about leaving laptops plugged in 24/7. But modern electronics automatically stop charging and so don’t overcharge. There’s a difference between knockoff chargers and third-party chargers. A third-party charger is an Apple- or Android-compatible charger from a reputable company like Belkin or Monoprice. Third-party chargers are OK to buy. Just know that, in general, they won’t charge your gadget as quickly or reliably as a maker’s official charger. Knockoff chargers usually don’t have a brand name, or they say they’re from Apple, Samsung, HTC, etc. but have a ridiculously low price. Knockoffs are often responsible for the horror stories you hear about gadgets bursting into flames or electrocuting users. Avoid them at all costs. Your safest choice is to buy your charger directly from the gadget manufacturer. 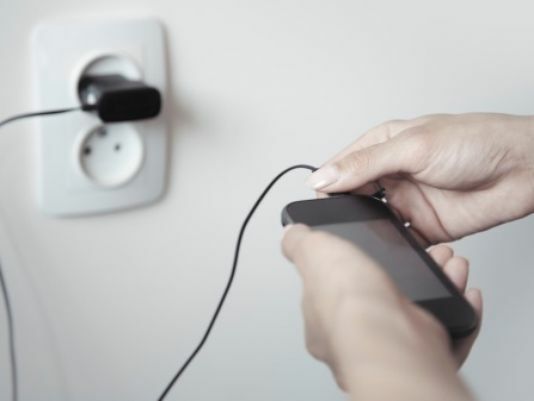 You should also know the signs of a shady gadget charger. Extreme heat and cold will harm both your battery life and battery health. I live in Phoenix, where during the summer car interiors can hit a blistering 160 degrees. Yes, it’s a dry heat, but so is an oven. Here, I’ve seen cellphone batteries swell and be destroyed within hours . In areas where temperatures dip below freezing, your battery won’t fare much better, and your gadget might actually die if you’re trying to use it outdoors. Of course, cold has other ways to kill electronics. Learn how to keep cold from killing your gadgets. When in doubt, read the label on the battery or your gadget’s manual. Or visit the gadget maker’s website and look in the support area. The battery will have an optimum operating-temperature range. Keep it in that range as much as possible. Unlike older Nickel-Cadmium batteries, which had a “memory effect” that meant you had to drain them every time, Lithium-ion batteries (the kind in just about every modern gadget), don’t have that problem. In fact, Li-ion batteries last longest when you keep them between 40% and 80% charged. Also, if you let Li-ion batteries discharge completely for too long, they can be permanently damaged or become dangerous, as I explain here. But Li-ions do have one polarizing challenge: The batteries have a built-in sensor that tells your gadget how much electricity is left in the battery and, over time, that stops matching up with the battery’s actual charge. To reset it, you have to charge the Li-ion battery to full, let it run down to the point where your gadget gives you a serious battery warning and then charge it back up to full again. However, this only needs to be done every three months or so. For some gadgets, you might not need to do it at all. Apple used to recommend this process but now says it’s no longer needed. Check your gadget’s manual to see if it has any specific directions. This myth goes all the way back to the early days of computers. Back then, computer parts, especially hard drives, wore out much faster than they do today. So, the idea was that to make your computer last longer, you should always shut it down at night. Many people still cling to that concept. Of course, modern computers have more robust parts, which means you can let them run with little to no problem. Whether you shut down your computer nightly now just comes down to personal preference. If you want your computer to do things like back up, update or other intensive tasks, you can schedule them at night while you’re not using your system. If you’re concerned about saving energy, turn it off. Or you can use one of your computer’s many power-saving modes, which are more convenient for getting it going again in the morning. Tip in a Tip: If you’re computer slows down to a crawl, often a reboot brings it back to normal. And by the way, if your Internet connection is slower than usual, try turning off both your modem and router for 60 seconds. This usually works to speed things up. This is a general myth that tech manufacturers love because it boosts sales. However, it isn’t always true, and sometimes can even hurt you. You might be deciding between a laptop with a 256 gigabyte solid-state hard drive and a 1 terabyte conventional hard drive. A 1TB drive is four times larger, but an SSD is much faster and more reliable. Plus, most people rarely even fill up a 256GB hard drive. Click here to learn more about the benefits of SSDs over conventional drives. Similarly, you shouldn’t automatically buy the camera with more megapixels or the smartphone with the highest-resolution screen. In a camera, image quality is as much about the size of the image sensor as the number of megapixels. With smartphone screens, after a certain point you can’t tell the difference in resolution (and most high-end and mid-range smartphones are past that point), but a higher-resolution screen burns battery life faster. Every Web browser has a private mode. When private browsing mode is on, the browser won’t record where you go and it wipes most of the information someone could use to piece together your online travels. In Internet Explorer, Firefox and Safari, you enter private browsing mode using the keyboard shortcut CTRL + SHIFT + P (CTRL + OPTION + P on Mac). In Chrome, you use CTRL + SHIFT + N (OPTION + SHIFT + N on Macs). Click here to learn more about private browsing and how you know you’re in private browsing mode. What you might not know is that private browsing isn’t foolproof. It doesn’t hide your browsing from your Internet service provider, the sites you visit or any law enforcement that happens to be watching. Ditto if there’s a logger on the computer or the router is set to record sites visited. Like most things in tech, private only means that it’s harder to find.